Last week Apple's battery recall, impacting 1.1-1.8 million 'Book users, was our lead story, and reports of MacBooks randomly shutting down were just making their way onto the Web. This week, it's our top story. Apple's official advice: Call AppleCare. Jason O'Grady takes a look inside an old iBook battery and finds AA Li-Ion cells - see Inside Your Notebook's Battery: Ordinary AA Li-Ion Cells for more on that subject. 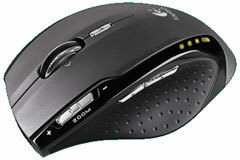 Logitech's Revolution laptop mouse has yet another positive review, and MacMice now has Danger Mouse available in black. Put that next to your black MacBook, Pismo, or Lombard! Random Shutdowns Caused by a Short Circuit? "The site, macbookrandomshutdown.com, is dedicated to the random shutdown problems encountered by the owner of a 2 GHz MacBook purchased in the summer of 2006." "Apple owners have been complaining (my, they're complaining) about random shutdowns of the new Intel-based MacBooks. "Now, a German article . . . suggests that it's because a cable to the heat sensor comes into contact with the processor's heat sink, melting the insulation and causing a short circuit - leading to a shutdown. Let the heat sink cool, and it doesn't touch the cable, and you can boot up. Get too hot and...."
Link: Are MacBook Random Shutdowns Caused by a Short Circuit? "Chris Price has found an update on MacBook Random Shutdown Syndrome (RSS). Apple has isolated it to a design flaw in the heatsink. He called Apple and asked why his MacBook repair was 'on hold' and they said that they were waiting for one part, a heatsink." "If your MacBook is shutting down intermittently, please contact AppleCare for service. " 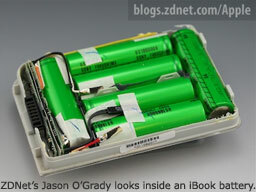 "Ever wonder what's inside your Apple battery pack? It turns out that they're not that complicated inside, but it's amazing how much power these little cluster of cells can hold. "I took an iBook G3 (dual USB) battery apart on the advice of Coconut Battery which told me that after 496 load cycles, this battery had seen better days." "Instead of writing out a full-blown review, I thought it would be nice to take a look at the new Apple MacBook in a question and answer type article. Please keep in mind that most of the answers below are based on the 13" MacBook laptop right out of the box, but I did answer a few questions based on the upgrades I made to it as well. "How does the MacBook look?" "What about that crazy looking keyboard?" "Is the iSight camera functional or just another gimmick?" "Is the trackpad button really mushy and non-responsive?" "Will the MacBook carry on the Apple tradition of frying my lap?" "Why does the white MacBook only have a 60 GB hard drive?" "Is the glossy screen a hit or miss?" "Does the MagSafe power cord have a habit of just coming loose?" "Now that the lid latch is gone, will my laptop lid constantly be flying open?" "How is the battery life on the MacBook?" "Will my Intel MacBook run older PowerPC programs?" "What can I do to make my MacBook perform even better than it already does?" "How difficult is it to add RAM and change out the hard drive?" "If I already have an iBook or PowerBook G4 is it really worth upgrading to a MacBook?" "So far the biggest improvement anyone's made to a mouse's scrollwheel was to allow it to scroll sideways by rocking it left or right. You can still do this with the MicroGear scrollwheel, but the big thing here is that you can switch it from the normal, 'geared' mode - which is the way all other scrollwheels work - to a truly free-wheeling style. With a flick of the finger, the scrollwheel spins freely for up to seven seconds depending on how hard you spin it. The result is much faster page scrolls. To switch modes you have to slide a switch at the bottom of the mouse and this can be a little bit tricky if you don't a suitable prong to hand." 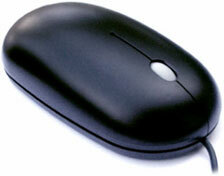 PR: MacMice announces a new matte black version of its flagship product, the Danger Mouse USB laser mouse. "Since Apple released its black iPod models, and then a black version of the MacBook, more of our customers have been asking for black versions of our MacMice products," says M.H. Peng, CEO of AllSpirit Co., Ltd., manufacturer of MacMice products, "The obvious place for us to start was to create a version of our industry leading Danger Mouse to nicely match the matte black finish of the MacBook." 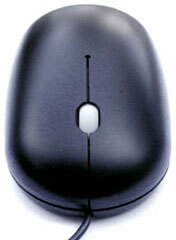 The Danger Mouse BLK has a matte black outer shell with two button, scroll button, and scroll wheel functions. Its 1,600 dpi laser pickup mechanism provides superior tracking performance on difficult surfaces. And, it's notchless MicroScroll mini scroll wheel gives an impressive sense of precision. It has a five-foot black USB cable, and is compatible with the standard mouse drivers included in either Mac OS X or Win XP systems. Danger Mouse BLK is available from the MacMice web site or any MacMice retailer worldwide for $29.99, and will begin shipping on September 14, 2006. PR: RadTech, makers of iPod and mobile computing accessories and more, today announced immediate availability of Portectorz for Apple Computer's Intel processor based notebooks. RadTech Portectorz provide positive protection for an electronic device's power, audio, video and data ports. Ports are positively protected from foreign objects, debris and liquids when fitted with custom-molded Portectorz. Constructed from high-polymer Silicone to eliminate tackiness and uni-die molded for a smooth, mold-line free appearance that can endure thousands of insertion and removal cycles. Portectorz are molded to exacting specifications to ensure a perfectly sealed and secure fit, and now features MagSeal for positively sealing Apple Computer's innovative breakaway magnetic power port. MagSeal consists of an embedded metallic insert, which draws the Silicone seal into the shallow MagSafe power port. Portectorz low-profile design ensures compatibility with all sleeves, bags, cases and packs. Use the entire Portectorz panel, or easily custom cut the strip to create protection for any of the ports or combinations desired - such as those used infrequently. MacBook Portectorz are now available in black to match this popular notebook's case color. Portectorz provide the protection and flexibility active users need to stay productive, while affording sensible insurance against potentially costly component damage. Portectorz start at $5.95 US, and are available for all recent Apple notebooks with displays measuring up to 15.4", all Apple docking iPods and Apple Airport Express WiFi transceivers. 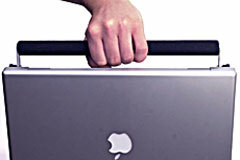 Portectorz for Apple 17" notebooks coming soon. PR: QuickerTek is now offering special $25 Off product bundle for Apple MacBook Pro Transceiver and Connect customers. When either of these products are purchased, a carry Handle is available for only $25 (half off the regular price) for Apple 15-inch and 17-inch MacBook Pro customers. "Our customers have had such success with both our Connect and Transceiver line of Mac wireless performance products that it just made sense to reward customers with a price deal. The huge AirPort wireless improvement our MacBook Pro customers get from both products made the Handle that much more relevant because with a larger wireless range, you're more likely to take the MacBook Pro mobile - and that's where the Handle makes obvious sense." said Rick Estes of QuickerTek. PR: EVDOinfo.com, the leading EVDO (EVolution-Data Optimized) wireless connectivity experts who focus on getting your Mac connected from anywhere using EVDO, announced today that they are releasing free directions to allow Sprint's newly announced Merlin S720 EVDO Revision A PCMCIA Card to work with 15" or 17" Apple PowerBooks. EVDOinfo.com has a history of releasing free information to allow EVDO cards to work with Macs, well before Apple or EVDO carriers add driver support. Last week Sprint was the first carrier to deliver EVDO Revision A Cards. Unfortunately, these cards are not currently supported by Apple's Mac OS X 10.4.7, nor does Sprint provide software or drivers for Mac OS X.
EVDOinfo.com is releasing free directions to allow any 15" or 17" PowerBook running OS X 10.4.7 to use the new Merlin S720 EVDO Rev A card. These directions require some technical knowledge and familiarity with the Terminal application. A detailed, step-by-step keystroke-by-keystroke eBook is included when ordering your Merlin S720 EVDO card and Sprint service from EVDOinfo's sister site, Booster-Antenna.com. CoreDuoTemp become a menubar application . Correction of bugs: window position, space folder location (installer and application). Note: these WallStreets are all upgradeable to G3/500 for less than $250 or to a G4/500 for around $400!